Experts say Celestron Outland X 10×42 Binocular is the best pair of binoculars any hunter can ask for. Not only is it affordable, features like protective rubber coverings to promote durability, twist-up eyecups for swift adjustments, and marked comfort all round add to Celestron’s efficiency. In addition to being water- and fog-proof, the Outland with its rubber cover is tough and won’t mind some rough handling. Its nitrogen-purged design makes Celestron ideal during any weather condition, making your hunting time better. The Celestron Outland X 10×42 Binocular comes designed with comfortable trapsthat rise to any emergency occasion. Semi-attached objective lens covers help keep things together and reduces risk of loss; the 4mm ones have tripod adapter threads to help with the same. You get the best comfort all round thanks to Celestron’s lightweight and ergonomic design. In addition to a smart carry pouch and four different sizes to choose from, you also get a no-fault lifetime warranty, making these binoculars ideal for any budget-conscious hunter. With very low price, so maybe it is the best binoculars for money. Magnification ×Objective lens is 10 × 42 mm. Angular field of view is 5.6°. Close focus in ft/m is 13/3.96. The field of view in ft at 1000yards/meter at 1000 meters is 293/320.54 ft.
A long eye relief of 14mm/0.55inches together with a field of view that’s ultra wide. Weight in 0z/kg is 22/623.69. The magnification is too large hence; some users prefer the 8X series. This is among the very few types of optic products that have gotten reviews from users found in a wide range of fields. Customers who have used it in heat conditions have commended its superiority likewise to those using it in cold environments. It is fog proof and has also been spoken highly of by customers working in snowy environments. When a user is rained on, the device still performs as ever before. In a nutshell, it is designed to give quality results and be durable in the worst environmental conditions that nature can give. The anti-fogging lenses and system has made it possible for customers to enjoy viewing even under changing humid and temperature levels. In addition to these, the product has given very good results when used in marine viewing since it is waterproof. 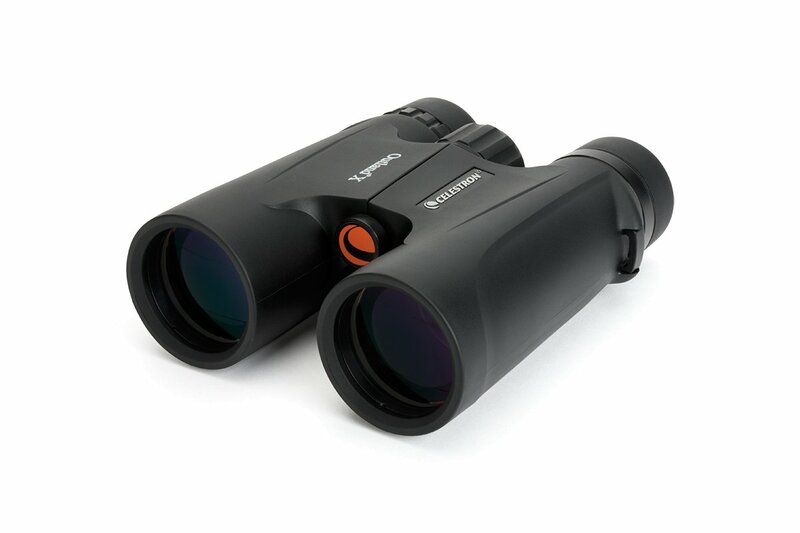 Sea air that is at times corrosive to some binoculars has no effect on the great Celestron Outland X 10×42 Binocular. It is truly the product that customers have always been comfortable using it anywhere. The multicoated lenses give a protective barrier against any harsh conditions. Many have been impressed at the identification of game by the use of this product since it is more precise via the magnification features of this. Spectators of sports have also talked of how they enjoy watching their most loved games with lots ofcomfort while using this ergonomically designed pair of binoculars. Their medium size makes it very easy to be held and used by such persons for extended periods of time. However, those participating in night time viewing have complained of ambiguity in the images formed by the product. The same customers have acknowledged that under well light conditions, this pair of binoculars comes out as just the best. Another complains is the fact that the eyecups are quite stiff hence becoming more or less uncomfortable to use. In addition, the eye relief is very small making it difficult for glass wearers to use it. The binoculars are most suited for people having small eyes and having just a small distance between their eyes. On the other hand, those with big eyes will probably not enjoy using it. Birdwatchers have been able to get the finest details with this product, details that they couldn’t get with any other device. The magnification is excellent and even the smallest specimen can be studied precisely and to the final detail. The pair of binoculars has helped many bird watchers and bird lovers to study the rituals and habits of birds while on the move. This is highly due to the large field of view that the binoculars boost of. The Celestron Outland X 10×42 Binocular is a best pair of binoculars that has been tried, tested and proven to be of great use with its performance and efficiency being quite high. The magnification is very superior making it not only good for the viewing other species but can also be used by astronomers and still register accurate results. The optics of the binoculars is just the best, employing the most modern technology in their design and the durability is unmatched. Having all these said in details, you still remain to be the jury and all the decision-making is upon you. Give these binoculars a try and you will never even realize that you used your money in buying it. It will give you back more than you have invested on it.